DISTINGUISHING TRAIT # 5: They make takfeer of every party and every sect of Muslims who do not submit to their islamic and political view. DISTINGUISHING TRAIT # 7: they legalize killing women children and weak for "petty" issues. DISTINGUISHING TRAIT # 9: They will not cease to appear until the last of them comes with Al-Masih Ad-Dajjal. DISTINGUISHING TRAIT # 15: THEY DUE TO THEIR FALSE INTERPRETATIONS FIGHT UNTIL THERE IS FITNAH INSTEAD OF DOING THE OPPOSITE. Doubt # 1 : ARE THEY ENJOINING GOOD AND FORBIDDING EVIL FROM THEIR DESTRUCTION AT SUCH SENSITIVE TIMES IN ACCORDANCE TO THE ISLAMIC PRINCIPLES?! Dr. Ali Muhammad As-Sallaabi, is graduate from the Islamic University of Madeenah al Munawwarah and has a doctorate ( PhD) from Umm Durmaan Al-Islaamiyyah. Initially the idea was of appending video clips, twitter screen shots, news articles under every trait to make it simple for the readers to compare and see how the trait and their actions match 200% . However i realized that not only would that be a bit risky but also more importantly ban many readers from sharing this article ahead due to security issues. So rest assured i will keep this article free from any such materials and links but at the same time enlist for you some distinguishing traits of the khawarij from which they are and should be known . Please note as i said above , it is not necessary that one or even two of the traits may not necessarily make someone a kharjee but if you read the following and couple it with what all is going on across the globe i am sure you will not doubt for even a second biidhnillah. Also it is known that they have come later or after the already established Muslim rulership of every desginated nations and now they make their takfeer and sought to kill everyone who doesn't. And many more narrations which endorse killing the one who causes dissension, crimes such as being responsible for the propagating, instigating and encouraging the killing of hundred thousand muslims as we have seen since the past 2-3 years . Having one or two traits from the below does not necessarily make someone a kharjee. This is a misconception that it does. However in the light of whatever is happening since decades and now in front of our eyes, Many of these traits combined convince their resemblance and more with the khawarij. And even if for the sake of argument one refuses to accept this then as shown in the start of this document killing such high level mischief makers is wajib. The most dangeerous, widespread and unique characteristics among the khawarij is that they will never follow the fahm of the salaf and scholars. Never. they will deny everyone from 10 Hijri to 800 Hijri if they have to if it opposes their own self interpretation. They will cling on to modern day taweelat or 19th century explanations because it adheres to their perspective and blatantly deny the fahm of salaf no matter how much you try. Imam al-Nawawi explains: Meaning, the basis of their statement was true. Allah says:The judgement is for none but Allah. [12:40] What they intended by it, however, was to reject ‘Ali’s [acceptance of] arbitration, may Allah be pleased with him. Abu Sa’eed Al-Khudri (radhiallahu `anhu) narrated: Once we were sitting waiting for the Messenger of Allah (sallalahu `alayhi wa sallam), when he came from the house of some wife of his. So we set along with him. On the way his shoe broke and Ali stopped and began to mend it while the Messenger of Allah (sallalahu `alayhi wa sallam) continued walking, and we followed him. Then at one place he stopped to wait for Ali and we stopped with him. He said: “There is amongst you he who will fight on the interpretation of this Qur’an just as I fought on its revelation.” So we began to peer around, and Abu Bakr and Umar were also amongst us at that time. But the Prophet (sallalahu `alayhi wa sallam) said: “No, he is the one who is mending the shoe.” So we conveyed this good news to Ali and it seemed as if he had also heard what the Prophet (sallalahu `alayhi wa sallam) had said. The original Kharijites misused the verse “there is no rule but for Allah,” (12:40) by not properly distinguishing between matters upon which Allah has definitively ruled and matters left open to interpretation, consultation, and human decision-making. Ali effectively refuted them with the Quran. O you scripture, speak to the people! (And indeed it has been revealed to you [O Muhammad], as it was to those [Allah's Messengers] before you: "If you join others in worship with Allah,[then] surely, [all] your deeds will be in vain, and you will certainly be among the losers) (Qur'an 39: 65). So be patient [O Muhammad]. Verily, the Promise of Allah is true; and let not those who have no certainty of Faith discourage you from conveying Allah's Message [which you are obliged to convey] (Qur'an 30: 60). قَوْلُهُ: «لَا يُجَاوِزُ تَرَاقِيَهُمْ» أَيْ: لَا يُقْبَلُ وَلا يُرْفَعُ فِي الأَعْمَالِ الصَّالِحَةِ. Here he explains the trait mentioned in the hadith about the Khawarij that they read the Qur’an but “do not go beyond their throats” that it means “Neither accepted nor raised are their good deeds“. In other words, even if the Khawarij read the Qur’an, pray tahajjud, fast every week, fight their self declared “jihad”, or assume about themselves that “at least they have good intentions and calling to Tawhid and Shariah”, it does not matter in light of the religion that Allah has sent down and their deeds are deemed worthless. Meaning as the title suggests, they make killing a piece of cake and they seem to act, propagate the notion that people cannot be compromised or taught or rectified or discussed with except via the sword. Look at those who branded him (al-Muhallab a brilliant war general who was known for his khawarij annihilation) a liar; they were either a group of his own people, who did so out of envy and hatred, or were Khawarij who, if they had been able to brand him as something worse than that, such as being an unbeliever, would not have hesitated to do so. In fact, the Kawarij think of al-Muhallab and all Muslims as unbelievers. Aren't they the same even today ?!! You will be able to relate this trait if you have seen and known what they have done in shaam against women , enslaving them and killing them for such reasons. They say every combatant is to be killed. We say yes but a woman shouting and throwing water or some small stones at you or her utensils at you for invading her house and kill her family is a combatant for you ?!! All those war booty you stole from fellow Muslim groups couldn't get you enough training to ignore or withstand a few utensils?! "There was a man in a village called Joubar, and his name was Samaak ibn Yazid. The ‪#‎Khawarij‬ came to his village, and took him and his daughter. They brought them forth to kill them, so the daughter said to them: “O People of Islam! My father is but an old hurt man, so do not kill him. As for me, I am just a young girl, and I swear to Allah, I never committed any immoral act, neither have I ever harmed any neighbor of mine, nor have I ... nor have I ..." But they brought her forward to kill her anyway, so she started crying out: “What is my sin? What is my sin?” Then she fell down fainting or dead, then they cut her body up with their swords". Maymun ibn Mahran (may Allah have mercy on him), the Imam, the Hujjah, the Scholar of the Peninsula, and its Mufti, said: "Do you know who is the Harouri Al-Azraqi i.e. the Khariji? He said: "He is the one who if you opposed his view, he would label you a Kaffir and make your blood lawful"
The basis of the misguidance of these ones is their belief about the Imaams of guidance and the main body of Muslims that they have exited the (confines) of justice and that they are misguided. This is the approach of those who have abandoned the Sunnah, such as the raafidah and those similar to them. So what they view to be oppression, they consider it to be disbelief and then innovate rulings for it. These are the three positions of those who exit the Sunnah in every situation, such as the Harooriyyah, the raafidah and those similar to them. They abandon some of the fundamental principles of the Islamic Religion until they come out of it, just like an arrow goes through a hunted game’. Other ahadeeth also point out to this trait of theirs. ( 52 ) حدثنا يحيى بن آدم قال : حدثنا يزيد بن عبد العزيز قال حدثنا إسحاق بن راشد عن الزهري عن أبي سلمة بن عبد الرحمن والضحاك بن قيس عن أبي سعيد الخدري قال : بينا رسول الله صلى الله عليه وسلم يقسم مغنما يوم خيبر ، فأتاه رجل من بني تميم يقال له ذو الخويصرة فقال : يا رسول الله ، اعدل ، فقال : هاك لقد خبت وخسرت إن لم أعدل ، فقال عمر : دعني يا رسول الله أقتله ؛ فقال : لا ، إن لهذا أصحابا يخرجون عند اختلاف من الناس ، يقرءون القرآن لا يجاوز حناجرهم ، يمرقون من الدين كما يمرق السهم من الرمية ، تحقرون صلاتكم مع صلاتهم وصيامكم مع صيامهم ، آيتهم [ ص: 742 ] رجل منهم كأن يده ثدي المرأة ، وكأنها بضعة تدردر ، قال : فقال أبو سعيد فسمعت أذني من رسول الله صلى الله عليه وسلم يوم حنين وبصر عيني مع علي حين قتلهم ، ثم استخرجه فنظرت إليه . His (i.e. Ali's (a.s)) murderer is one of them (i.e. the Khawarij), and he was Abd Al-Rahman bin Muljim Al-Muradi, despite that he was one of the best of mankind in worship, and one of the people of knowledge. You will be surprised to read about a narration wherein it was reported that the kharjee Ibn Muljim (la`natullah alayhi) who killed `Ali when his body parts were being cut he kept reciting takbeer, tahleel, tahmeed without any regret and when they went to cut his tongue he resisted saying i don't want to die except in the state of dhikr.!! الأخوة الكرام : روى الذهبى فى تاريخه 2/254 أنه "لما دفن على أحضروا ابن ملجم، فاجتمع الناس، وجاء بالنفط والبوارى، فقال محمد بن الحنفية- أحد أبناء على- والحسين، وعبد الله بن جعفر بن أبى طالب، دعونا نشتف منه، فقطع عبد الله يديه ورجليه، فلم يجزع ولم يتكلم، فكحل عينيه، فلم يجزع وجعل يقول: إنك لتكحل عينى عمك، وجعل يقرأ "اقرأ باسم ربك الذى خلق" حتى ختمها، وإن عينيه لتسيلان، ثم أمر به فعولج عن لسانه ليقطع، فجزع، فقيل له فى ذلك، فقال: ما ذاك بجزع، ولكنى أكره أن أبقى فى الدنيا فواقا لا أذكر الله"!!! فهل صح هذا !!!! وإن كان فما وجهه مع النهي الأكيد عن المثلة ؟ أيعتبر ذلك من رأيا في عقوبة المحارب ؟ غير أن الإمام علي رضي الله عنه لم ير في قتله حرابة ، بل روي عنه قوله للحسن بن علي رضي الله عنه " أحسنوا إساره فإن عشت فأنا ولي دمي ، وإن مت فضربة كضربتي " . أفيدونا بارك الله فيكم . This however is a weak report. Nevertheless i am not surprised because there was a reason why the prophet `alayhis salaatu was-salaam said : " You will feel your prayer inferior to theirs and your recitation lesser than theirs"
(2465) - (قال الزهرى: " هاجت الفتنة وأصحاب رسول الله صلى الله عليه وسلم متوافرون , وفيهم البدريون فأجمعوا أنه لا يقاد أحد , ولا يؤخذ مال على تأويل القرآن إلا ما وجد بعنيه " ذكره أحمد فى رواية الأثرم. As has preceded above under trait no. 3, their actions always harm the general Muslim population, inflict more rules against them. Give the enemies more reason to torture and oppress innocent Muslims. The CTS bill of UK is a small example of this. We were in the city of Al-Ahwaz on the bank of a river which had dried up. Then Abu Barza Al- Aslami came riding a horse and he started praying and let his horse loose. The horse ran away, so Abu Barza interrupted his prayer and went after the horse till he caught it and brought it, and then he offered his prayer. 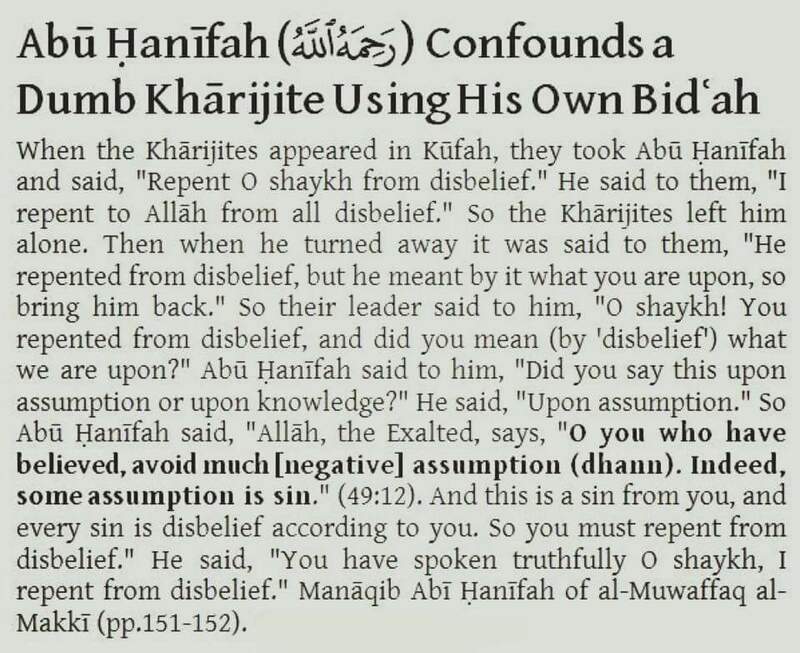 There was a man amongst us who was (from the Khawarij) having a different opinion. He came saying. "Look at this old man! He left his prayer because of a horse." On that Abu Barza came to us and said, "Since the time I left Allah's Messenger (ﷺ), nobody has admonished me; My house is very far from this place, and if I had carried on praying and left my horse, I could not have reached my house till night." Then Abu Barza mentioned that he had been in the company of the Prophet, and that he had seen his leniency. 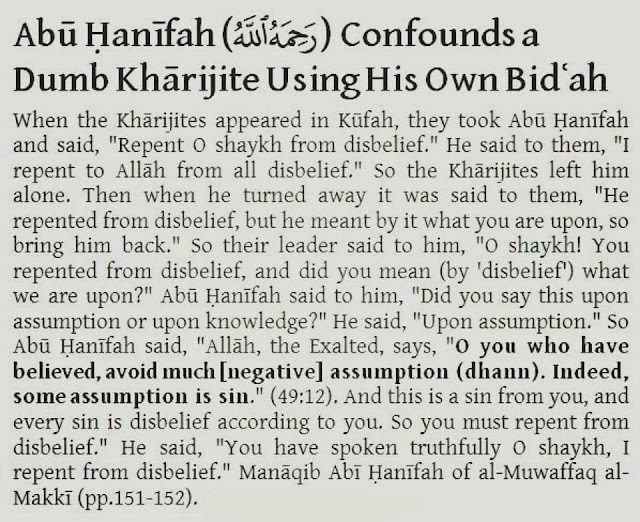 This narration shows us also how the khawarij disregard people of excellence (such as this sahaabi) and their status and criticize anyone they want to not paying regard to if they are old men, scholars, rulers, women, teenage etc. You will notice even today they treat scholars who oppose them as trash and even the scholarls whom they referred to day and night, when he opposes them they kill him, mock him and as usual the regular chant of " scholars for dollars" and " govt sultan" begins. While for many , we could blame their immature youth teenage hormones for such irrational behavior but at the same time the kharji sifat they have traversed upon and adopted should not be ignored . Book of Good Manners and Form (Al-Adab) Chapter: "Make things easy for the people and do not make things difficult for them." 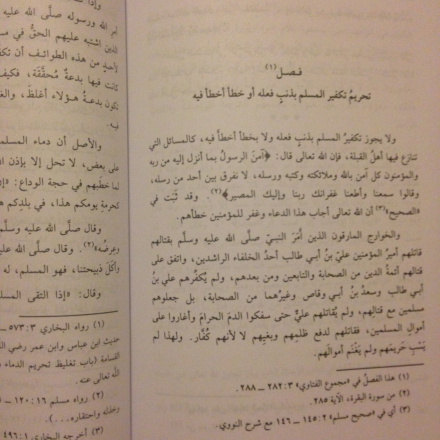 Ibn al-Jawzi tells us: `Ali returned from Siffin and entered Kufah: the Khawarij did not follow. Instead, they settled in Harura. There were twelve thousand of them, and they were (misusing the quranic verse and texts ) declaring: la hukma illa li’Llah – “There is no judgement, except Allah’s (for the wrong reason to split from `ali) .This is how they initially started. “Then off they went, slipping away alone to avoid detection so that no-one would be able to stop them leaving. They went from the midst of their fathers and mothers, and uncles and aunts, leaving behind kith and kin. This they believed in their ignorance, with little knowledge or understanding, to be pleasing to the Lord of Heaven and Earth, not realising that it was in fact of the gravest of enormity, most destructive of sins among monstrosities and wrongs, and that this had been made attractive to them by the devil and their own egos, hell-bent on wickedness. Subhanallah, how familiar is this with what is happening today ! Praise be to Allah who has kept their sifat the same throughout the years to make it easy for us to recognize them. Al-Sarkhasi ( rahimahullah) said: It is not proper for a Muslim who has been offered protection to betray them, because betrayal is haraam. وسمعت الحاكم أبا عبد الله الحافظ يقول: سمعت أبا بكر محمد بن أحمد بن باكويه الحلاب يقول: سمعت أبا بكر محمد بن إسحاق بن خزيمة يقول: سمعت أحمد بن سعيد الرباطي يقول: قال لي عبد الله بن طاهر: يا أحمد إنكم …..تبغضون هؤلاء القوم جهلا، وأنا أبغضهم عن معرفة. أولا: إنهم لا يرون للسلطان طاعة. They will kill Muslims and spare/leave alone the Idol-worshippers. 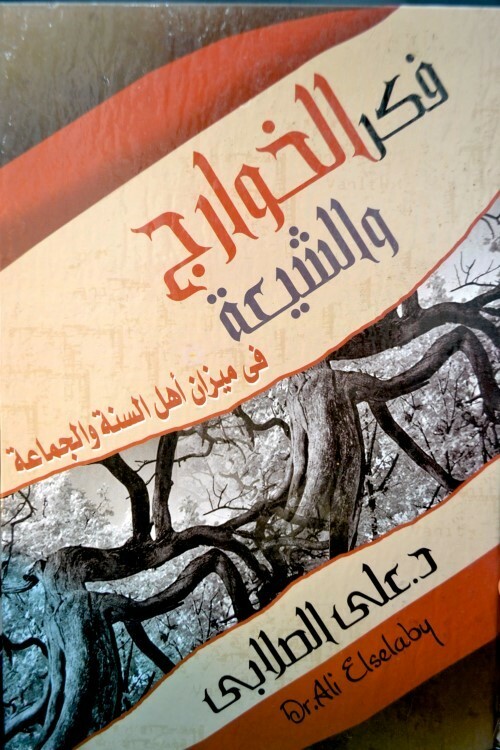 The historians al-Tabari and Ibn Kathir chronicle alarmingly precise accounts of their intimidation, violence and terror. Under the events of 37H/657CE they detail how the Khawarij began terrorising the countryside around Nahrawan, Iraq, subjecting those whom they caught to an imtihan or “inquisition”. If the answers failed to satisfy their zeal for purity, or agree with their understanding of things, then the punishment was death. Things came to a head when they chose ‘Abd Allah, son of an early companion, Khabbab b al-Aratt, as their victim. A number of the Khawarij rode into his village for supplies and thought to make an example of him. They fired their loaded questions at him. They first asked him about the caliphates of Abu Bakr, ‘Umar and ‘Uthman. ‘Abd Allah extolled them all and praised their successive caliphates. So far, so good. They then asked him about ‘Ali, and his state before and after the arbitration or tahkim. ‘He has far greater knowledge about Allah than you do,’ replied ‘Abd Allah, ‘and has much more piety in terms of his religion and possesses greater insight.’ With that, his fate was sealed. "I heard the Prophet (sallalahu `alayhi wa sallam) say : There would arise at the end of the age a people who would be young in age and immature in thought (hudatha’ al-asnan wa sufaha’ al-ahlam) , but they would talk (in such a manner) as if their words are the best among the creatures. Ibn Hajr commented: ‘The Khawarij, what led them to judge those who opposed them to be disbelievers, making their blood lawful … and engage in fighting and killing Muslims? All this is from the vestiges of those who worship upon ignorance; those whose hearts haven’t been expanded by the light of knowledge. nor do they hold tightly to the firm rope of knowledge.
" الذين ليسوا بقراء للقرآن ولا فقهاء في الدين ولا علماء في التأويل ولا لهذا الامر بأهل في سابقة الاسلام، والله لو وُلُّوا عليكم؛ لعملوا فيكم بأعمال كسرى وهرقل"
They are neither Qurraa (i.e. reciters of the Qur’aan who follow it as it should be followed) nor are they a people of astute understanding in the religion. Neither are they scholars in the (science) of explanation of the Qur’aan nor are they worthy of this affair (with regards to what has already) taken place in Islaam. By Allaah! If they were to be placed in charge over your affairs, they would (perpetrate) the deeds of Khosrau (i.e. Chosroes) and Heracles amongst you. This is precisely why Ibn ‘Abbas, in his debate with them, told them ‘I come to you from (scholars such as ) the Emigrants (muhajirun) and the Helpers (ansar), and the son-in-law of Allah’s Messenger (sallalahu `alayhi wa sallam). To them the Qur’an was revealed. They are more learned about its meanings than you are; and there is not a single one of them among you !! يُصعقون فقال : ذاك فعل الخوارج. - Or because they get some benefits in non muslim lands which they don't in Muslims so they forget all the other benefits the muslim lands gives them and their deen due to some monitery benefit they recieve in non muslim lands. so on and so forth. the people at the top level calling for democracy and change are mostly due to personal gains such as share holdings of their own companies in govt sectors . This is not the place to enlist such sensitive details, however the learned and experienced reader gets the idea i am trying to pitch across. This is a big virtue, to adjoin thanking people with thanking Allah for their favours. And another hadeeth says do not belittle any little deed or that no good deed is insignificant even if it be smiling at your brother and the prophet included these small examples into charity! Such is the reward and status for even such tiny deeds in Islam ! Another hadeeth compares such small actions of good such as filling someone's bucket equal to forbidding evil and enjoining good if a man cannot do it via other means. Afterwards the Muslims used to attack the pagans around her abode but never touched her village. One day she said to her people, "I think that these people leave you purposely. Have you got any inclination to Islam?" They obeyed her and all of them embraced Islam. Abu `Abdullah said: The word Saba'a means "The one who has deserted his old religion and embraced a new religion." Abul 'Ailya said, "The s`abis are a sect of people of the Scripture who recite the Book of Psalms." There are many more instances showing how the prophet and his sahaaba and even till this date the honourable men and people with dignity do not forget a small favour done by even their enemies. but the khawarij especially of today are worse than the khawarij of yesterday because the previous one's at the very least admitted and acknowledged the merits of the muslim rulers however the khawarij of today twist and turn and make false excuses demonizing even billions and trillions of dollars spent by the Muslim states . #reminder_no_1 : the Messenger of Allah (peace be upon him) came to Medina while there was no fresh water therein but Rumah Well? Thereupon, the Messenger of Allah (peace be upon him) said: "Who would buy the Rumah Well and give water to Muslims for a better well in Paradise? Thereupon, I bought it from my money, but today you prevent me from drinking therefrom until I drink from sea water? They said: By Allah, this is true. #reminder_no_2: the Masjid did not encompass the people who were offering Salah therein, thereupon, the Messenger of Allah (peace be upon him) said: "Who would buy the land of so and so to expand the Masjid for a better land in Paradise? Thereupon, I bought it from my money, but today you prevent me to offer two Rak`ahs therein? They said: By Allah, this is true. #reminder_no_3: I equipped the army of hardship from my money? They said: By Allah, this is true. The reason the neo khawarij of that time were better than the one's today is because they at the very least acknowledged openly the merit and goodness the ruler had and contributed to, whereas today they twist every good deed and contribution of the kingdoms and muslim states into a conspiracy theory demonizing or neutralizing their good deeds. There is an important rule concerning enjoining good and prohibiting evil. An example of this is when the Prophet (sallalahu alayhi wasallam) forbade the killing of Abdullah Ibn Ubayy - even though he was a well known Munafiq (hypocrite) - as his killing could have resulted in a greater evil and harm to the Muslims. Opposing the evil has four level: The first is when (by opposing) it vanishes and the opposite of that evil remains. Second is when it weaken but do not vanish completely. Third is when by opposing it another evil of its kind replace it. Fourth is when it is replaced by a worse evil. It is very hypocritical of these khawarij who claim to be following the sunan of the Messenger of Allah (sallalahu `alayhi wa sallam) yet they do not follow what he did for 13 long years inside Makkah when the Muslims were weak. On the contrary for a few years now within 4-7 years itself they have wrecked havoc across the Muslim world. They claim to be following the sunan yet their victims are only Muslims. While the sunnah was that the prophet did not even kill someone like ibn ubay then what about having Muslims killed purposely? The prophet (sallalahu `alayhi wa sallam) and his companions stayed hungry for night and day working to build a trench so the Mushrikeen of Arab could not enter the city of Madinah and harm Muslims. the very same prophet also struck deals with the munafiqeen and yahood so as to ensure the Muslims inside were safe. He did all of this so the Muslims inside would remain safe and what these khawarij do is the total opposite. -All Muslim rulers are Kuffaar. This stems directly from the teachings of al-Mawdoodee and Qutb. -All forms of ruling by other than the Sharee'ah is Kufr, irrespective of whether the ruler has made Istihlaal or not (i.e. regardless of whether the ruler believes in replacing the Sharee’ah or not. Sunni scholars affirm that replacing the Sharee’ah constitutes Kufr, otherwise it may not, however ISIS don’t make this differentiation). -There is no difference between Kufr that is agreed upon and Kufr that the scholars have differed upon. All acts of Kufr are interpretated as being Kufr, without any excuse of Ijtihaad or ignorance. -There is no difference between Mu'aawanah (cooperating, even if it is for a legitimate Islaamic reason), Mudaahanah (making treaties for the benefit of Islaam and the Muslims) and Ta'aaluf (softness) with the Kuffaar - all of it is Kufr. -There is no differences between Istihlaal or weakness of sins (refer to point 2). -The Tawaagheet (pl. Taaghoot: something obeyed besides Allaah) of the living are worse than the Tawaagheet of the deceased. Meaning, the Kufr of the rulers is far worse than grave worship. -Making Jihaad against the rulers is Fard al-‘Ayn (an obligation) upon every single Muslim. -Ijtihaad that dictates Jihaad not being present or Fatwaas issued restricting the conditions of Jihaad, is Ijtihaad that is void and unacceptable. -Jihaad against the rulers takes precedence against the Kuffaar Uslee, because we need to defend the Muslim lands, establish a state, and remove apostasy as Riddah is worse than Kufr Uslee. -Scholars, ministers, soldiers, police officers and all government workers are also Kuffaar by association of their governments. Sunni scholars have conditions for declaring others as leaving the fold of al-Islaam known as ad-Dawaabit at-Takfeer. From them is that the mistake must be clarified before placing a ruling on people. -The Muslim Ummah today is like the time of Aboo Bakr. Aboo Bakr was faced by tribes that became apostates and they view that their cult as being like the city of al-Madeenah; a place for the Muslims and anything besides this are cities and countries which have become apostates from al-Islaam and are destined to the fire. Based on this, the whole world is Daar al-Kufr (possibly Daar al-Harb) including Makkah and al-Madeenah. -The average Muslim falls under four: Kaafir (disbeliever), Murtad (apostate), Mastoor Haal or Majhool al-Haal. Haal: meaning, they appear to be Muslim but their beliefs/allegiance are uncertain. Majhool al-Haal: meaning, this person is not a Muslim in his appearance and it is not apparent by his action. It is permissible to kill such a person and take his wealth. Note: All of these categorizations and innovated principles have only been introduced into the religion to justify killing innocent people and permit mass murder. -There is no such thing as treaty or excuses, anybody that does not hear and obey the Caliph or uphold to the body of the Muslims, then they are eligible to be fought and killed. Thus they believe legitimate leadership only belongs to them and if anyone disagrees must be killed as apostates. -Lying, deceiving and treachery are allowed as its part of war. Therefore its allowed to hide ones beliefs in order to infiltrate and create splinter cells. This clearly contradicts the conditions of Jihaad, of them, having an Imaam and fighting on the battle field alone. -All rulers are either Kuffar, apostates or hypocrites, as well as all their citizens. They issued a verdict stating that merely holding a visa or a nationality makes one Kaafir by association. Some of their quotes even state one is a Kaafir even by raising a flag. -The scholars are hypocrites and their Fatwaa is null and void. -Major sins takes one out of al-Islaam. Interest, fornication, bribery and not giving allegiance to the Caliph are all acts of apostasy. -Women, children and the elderly are all fair game and their intentions are not questioned. -Non-Muslims are subject to war also, irrespective if they are a Dhimmee (a non-Muslim citizen in an Islaamic country), Musta’man (a person who has been granted security by a Muslim country), Mu’aahad (a person who has a treaty with a Muslim country), and killing them in greater number is more virtuous. -Possessing citizenship shows one is pleased with Kufr. Thus his wealth, honour and blood are permissible and are deemed as apostates as they have chosen to mix and live with the Kuffaar. -Possessing a visa is not an trust (Amaanah); if it is then we are allowed to take it with deception and not uphold it's conditions – with the purpose to kill and massacre.